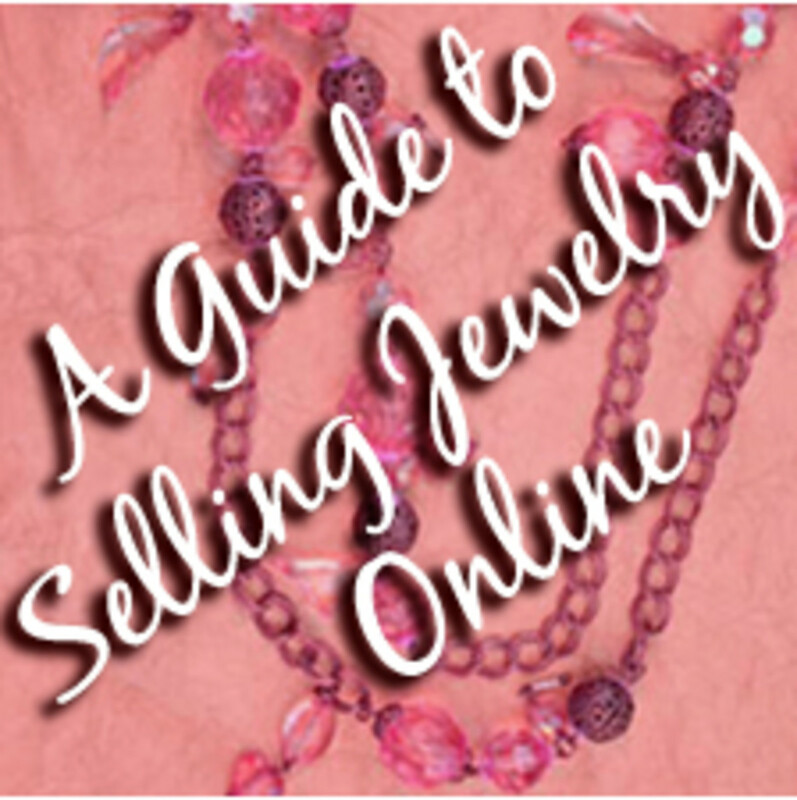 Can't find what you want on eBay, or looking for somewhere else to sell your products? There are plenty of sites like eBay available (for both buyers and sellers) that can offer you reduced fees, stronger protection and specialise in certain categories or geographies. eBay started in 1995 as a simple place to bring buyers and sellers together and is one of the most well known Internet success stories. Since then, eBay has expanded rapidly and regularly added new features to keep it at the forefront of online auctions. 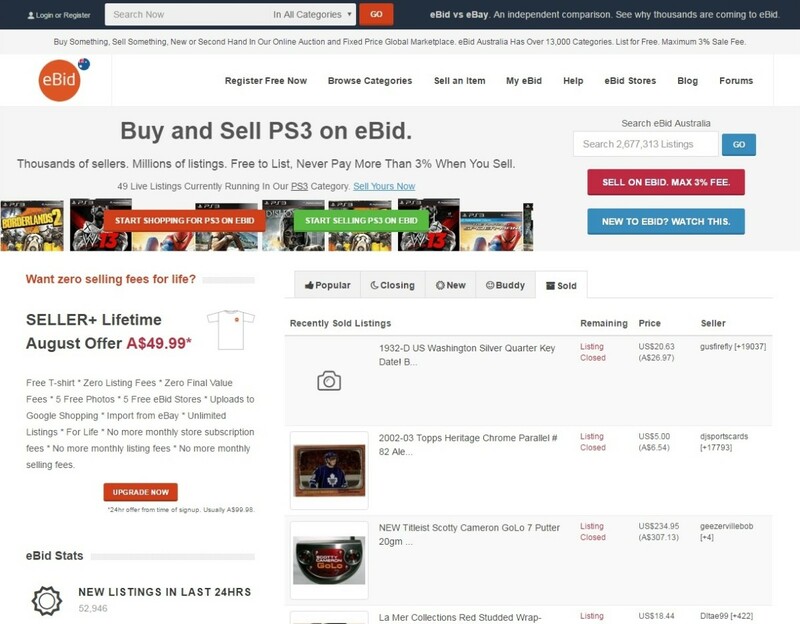 Improvements such as the buy-it-now and store options now make it the most popular online auction website available, where you can find anything from clothing to video games electronics and collectables. Many sites like eBay listed below focus on reducing your selling expenses (both listing fees and selling fees). This is a common issue with eBay for high volume sellers who find the selling fees cut into their profit margin. My dad loves to sell things on eBay regularly but after listening to him complain about fees, I decided to track down some alternatives for him (which you'll find below). 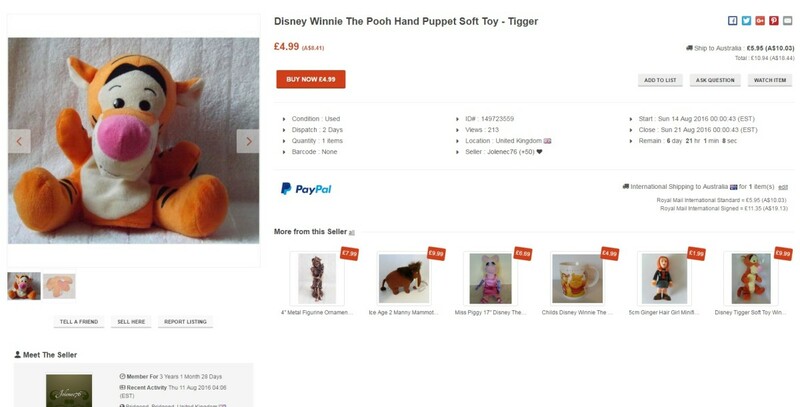 He now sells across a number of sites which has helped him branch out and remove his dependence on eBay as a selling platform (and he couldn't be happier). To help you choose the ideal website for you each option includes a handy table of quick information. Stop by the comment section to share your favourite auction website. 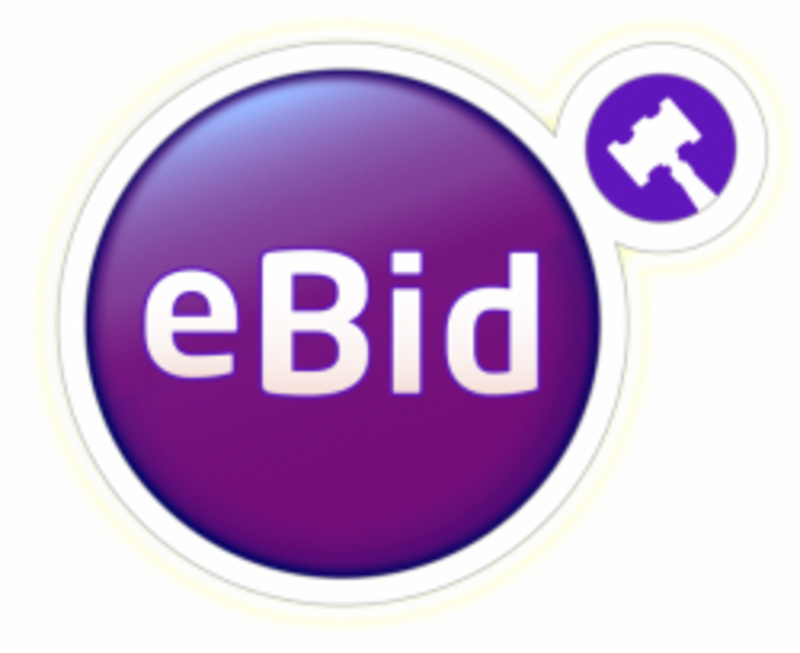 eBid allows you to buy and sell anything and is one of the great eBay alternatives. eBid currently accepts sellers in over 20 countries but allows buyers from well over 100 different countries, although like eBay each seller can determine where they ship to. eBid offers its own PPPay payment method but does also support the common methods of PayPal, Moneybookers, and Google Checkout. On eBid, you can list any basic auction for free, meaning you are only charged if you make a successful sale, one of its greatest benefits over competitor auction sites. 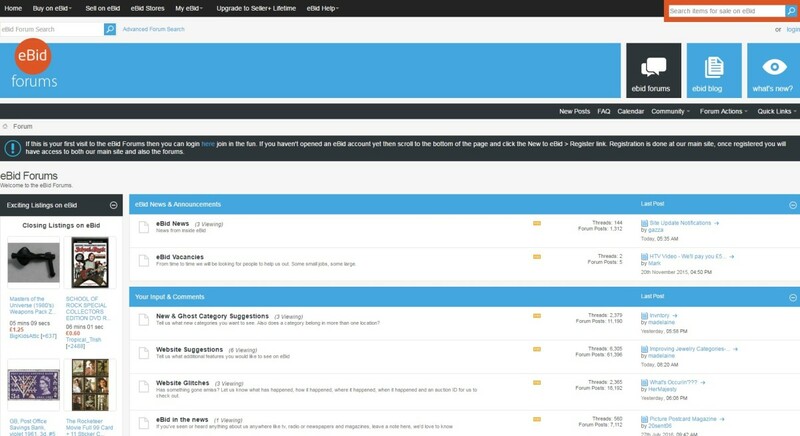 eBid offers a number of membership levels: Buyer (free), Seller (free with verification), and Seller+ with an annual fee which allows you to set up up to five stores and unlocks a number of other premium features to make selling easier, more efficient and give you a a greater level of exposure in the item listings. If you are looking to grow your online business, then try out eBid. It's also great for buyers, with an average of over 5 million listed sales live at any time, ensuring the level of variety will not disappoint. eBid offers country-specific listings for nearly two dozen countries, including the US, UK, Canada, Australia, New Zealand, Italy, Singapore, South Africa, India, Ireland, France, and many others. eBid also offers continental networks to ensure that everyone around the globe can buy and sell. Strong search features to find what you need. 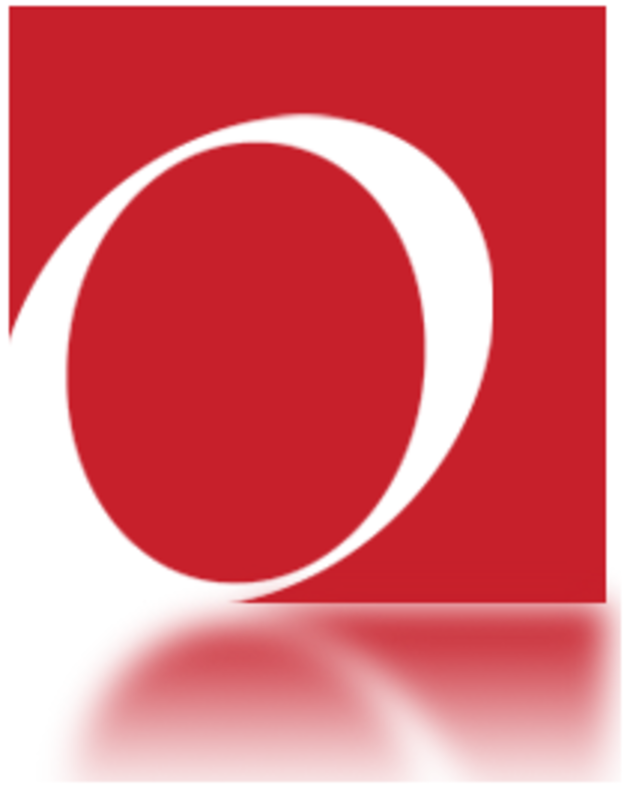 Overstock has grown into a successful online retailer since it began in 1999. Originally focused on selling surplus stock at less-than-wholesale prices Overstock has more recently evolved into selling their own merchandise direct to the consumer, making them more comparable to the likes of Amazon.com. 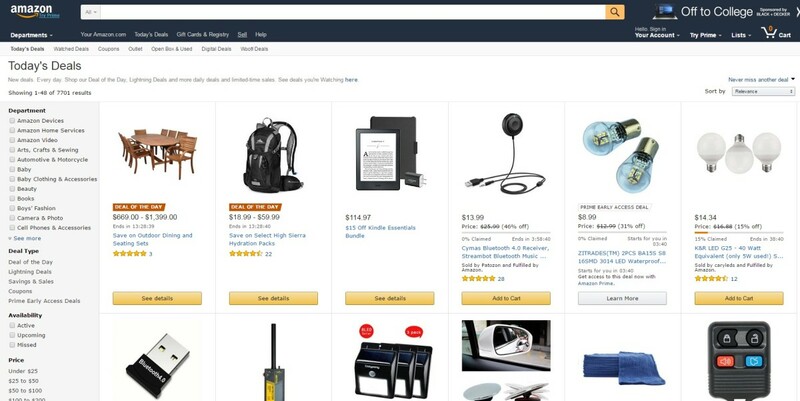 While selling on Overstock will be hard to achieve as a single seller (all sellers are required to be approved by Overstock), the website and its high traffic levels (top #1000 website per Alexa.com) make it ideal for small to medium enterprises looking for growth opportunities. On the other side of the fence buyers are also going to find Overstock.com to be a great opportunity with strong discounting across the website due to the nature of stock and some of the most highly rated customer service in the industry. If you are a large eBay seller and feel like you have outgrown the platform or want to bring down your selling costs the very reasonable pricing available at Overstock makes it an ideal option. All sellers are businesses and checked by Overstock. If you are an experienced eBay seller but fed up with the fees and looking to go out on your own then Shopify is the alternative you've been seeking. 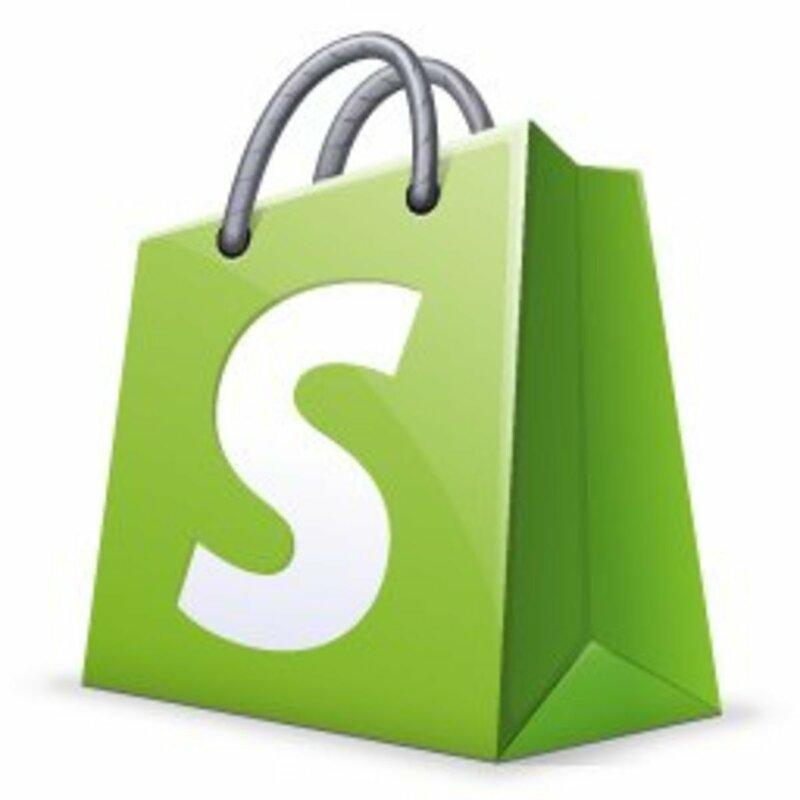 Shopify is the easy and professional way to take the leap into self managed ecommerce with a platform that lets you create your own store front. Select from hundreds of professional templates that can easily be customised to give your store its own personality. Shopify is much more than a beautiful storefront, though, you've got all the data you need to make important decisions, track everything from visitors to purchases, and even track abandoned orders to understand how your visitors use your store and optimise your conversion rate. Shopify even lets you create gift card and coupon codes so you can have regular promotions with ease. Stop giving your profits away to eBay and similar auction websitesand venture into eCommerce for yourself with a professional Shopify store packed with features. Amazon is one of the most popular and well-known sites like eBay and serves as a great alternative for buyers and businesses looking to grow their online presence. 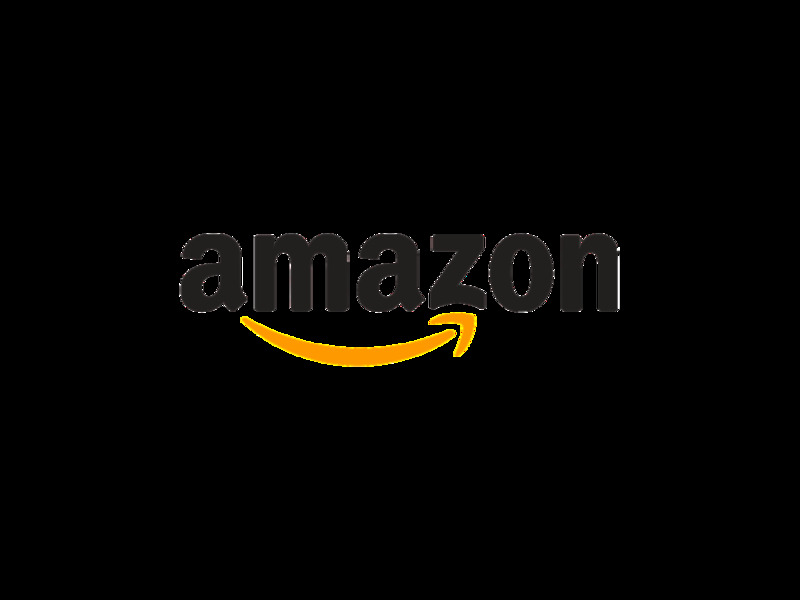 Amazon started back in 1995 and has since expanded outside the United States to have separate warehouses (and websites) for a number of countries (most notably Canada and the United Kingdom). Those within these geographic locations can access a huge inventory of items from both Amazon and their third party sellers. 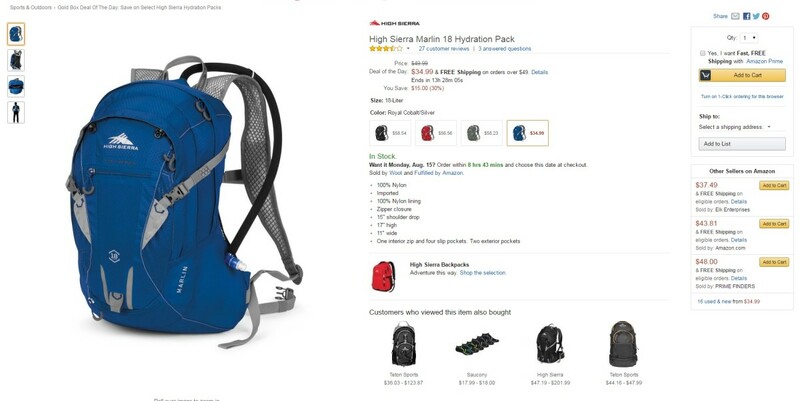 Popular product lines on Amazon include toys, baby products, sporting goods, health, beauty, clothing, groceries, DVDs, books, and consumer electronics. It now also offers e-book sales for the Kindle, Instant Watch movies, and MP3 downloads. While Amazon has an extensive collection of products, nearly 50% are actually offered by third party sellers. The website experience is one of the best with robust security, detailed product reviews and the always popular amazon gift card that enhances an already strong stream of traffic to the site, making it ideal for sellers. 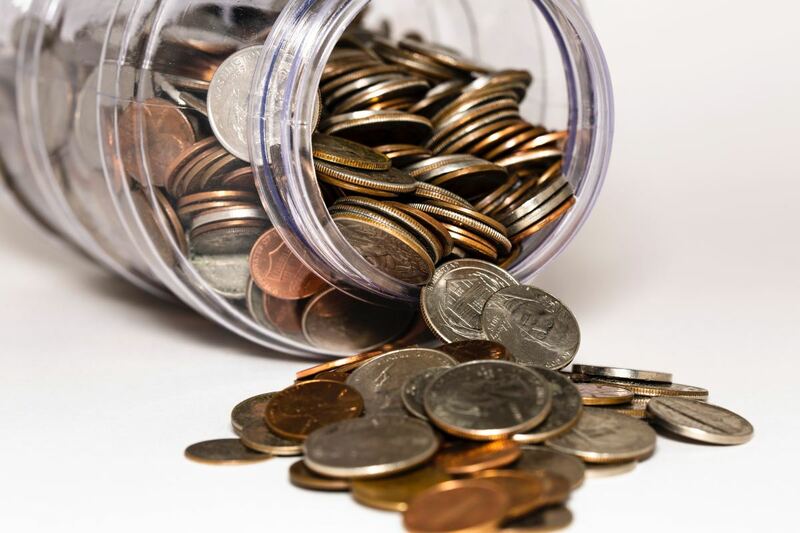 Fraud prevention in particular has always been at the top of the list for CQout, and it is definitely one of the top auction websites in this regard. 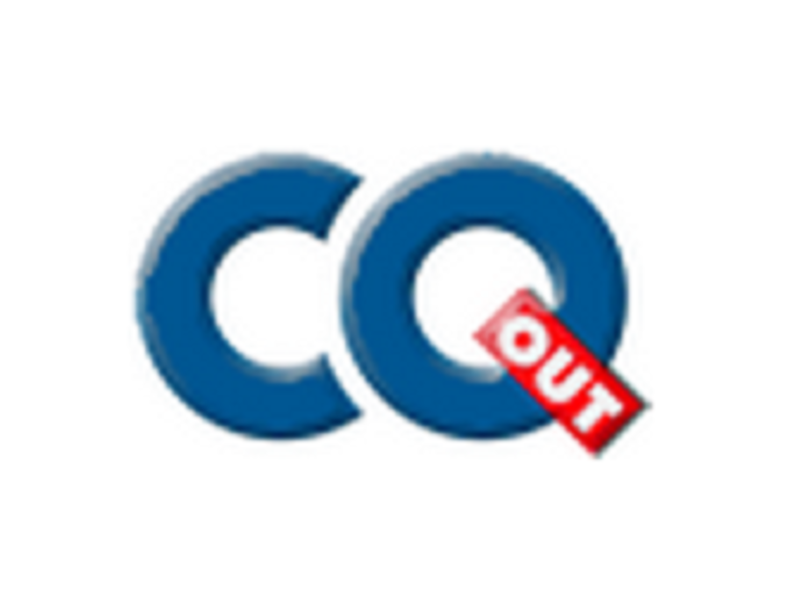 You're bound to encounter less issues with CQout than you would with most other websites which makes the experience more enjoyable. The one-time account setup fee helps to prevent fraud and protect your identity (and it is well worth it at only $.50). Sellers will particularly enjoy the ability to set a reserve price for their auctions, fees only charged on sales and the premium options for store front creations. 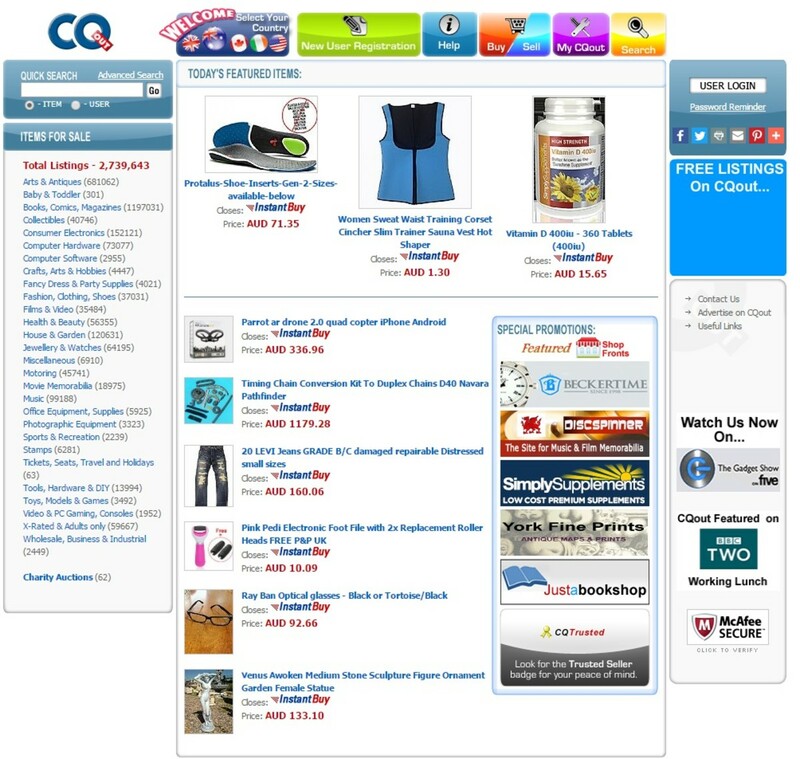 High traffic parts of CQout include arts, electronics, books, and home, with all other standard categories also available. Meanwhile buyers benefits from automatic bid features and the ability to posted wanted ads similar to classified ad websites where sellers can fulfil your product requests. 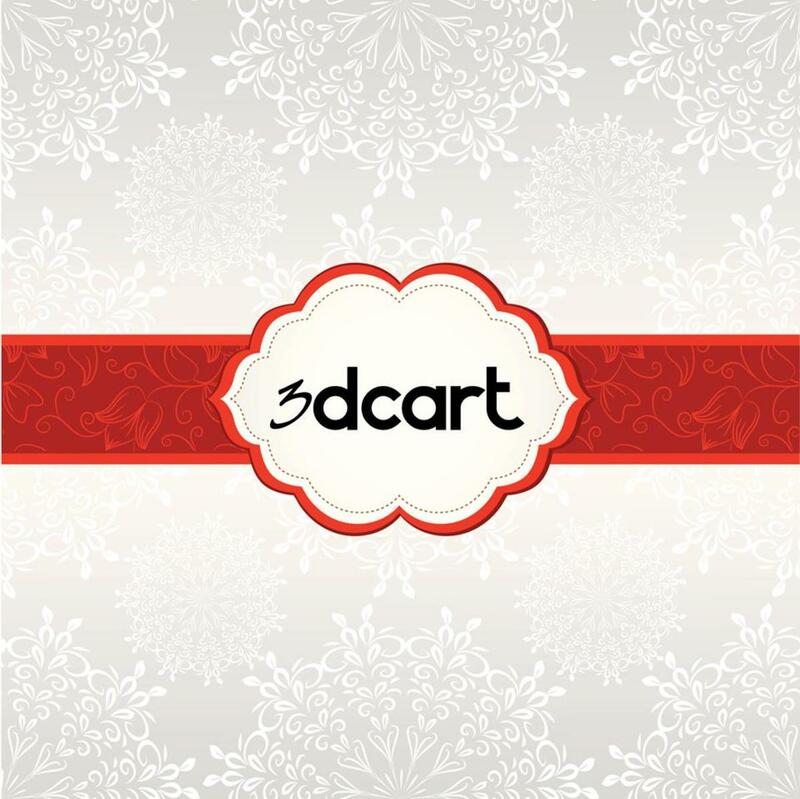 3dcart is another option to create your own eCommerce store and is similar to Shopify featured above. 3dcart is ideal for smaller sellers who want to try out creating their own store on a manged eCommerce platform but want to keep their start up costs to a minimum. This is achieved on 3dcart due to the different plans that are based on the maximum number of products you wish to sell which does help the small sellers start out with a cheaper option than they might be able to access elsewhere. With your 3dcart subscription, you'll get a great range of benefits including the ability to accept a wide range of payment options (without ongoing transaction fees that some other sites use), an easy-to-alter template, 24/7 support, and even tools to make shipping easier. 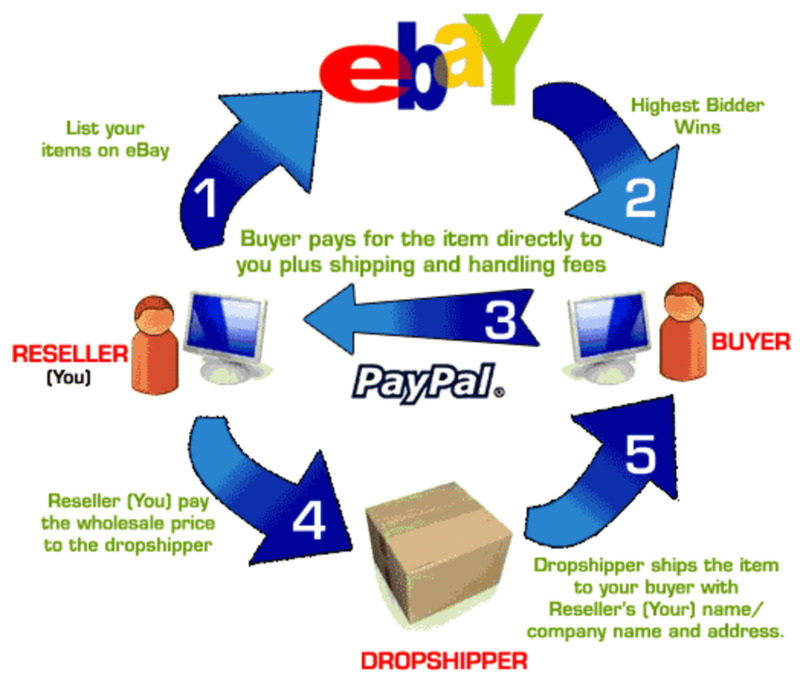 If you want to take your eBay selling up a step, then 3dcart an option worth considering especially if you don't need the more powerful and expensive options of Shopify such as point of sale connections and social media selling. 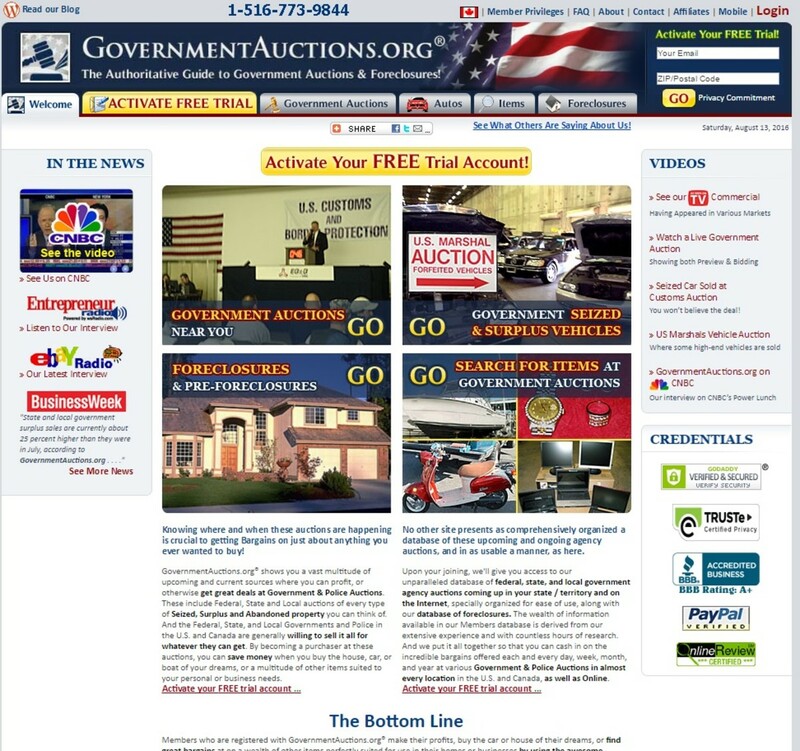 Government Auctions is all about getting a bargain. By focusing on oversupplies, warehouse closeouts, foreclosures and more (with an obvious government theme) it's easy to pick up a great deal for those inside the US. This includes things like unneeded clothing, materials, cars, trailers and everything in between. 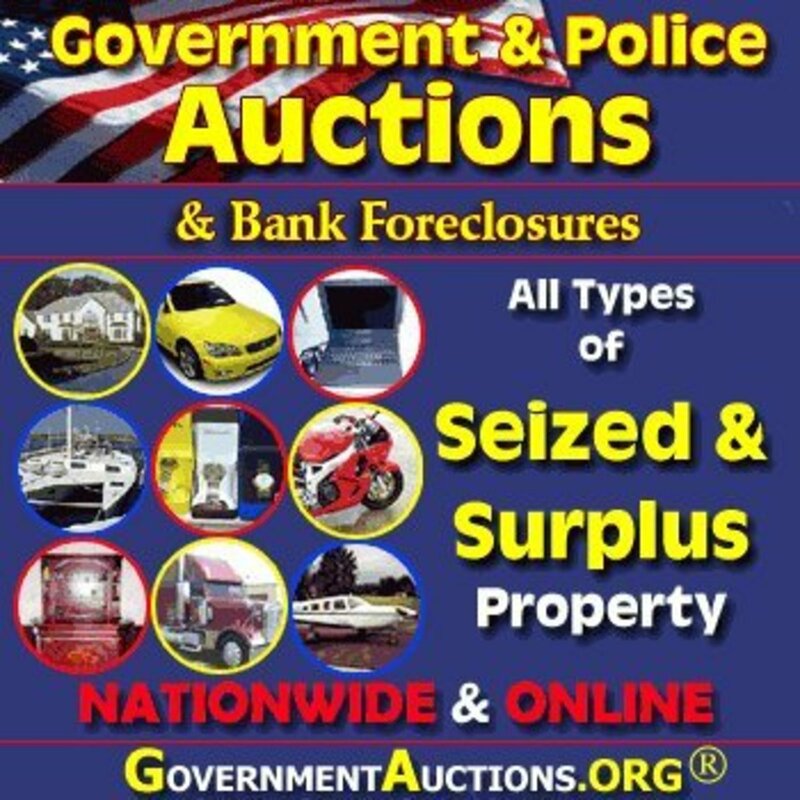 The sheer number of variety makes Government Auctions a great auction website to check from time to time to see what latest deals are available. While some items are unique one off sales the majority come in bulk which means you rarely miss out on an auction as multiple items are auctioned off at once. Government Auctions also has domestic shipping across the US and overseas (limited to countries close geographically to the US for all but the most bulky items. The most popular categories available include: aircraft parts, marine, computer, office, construction, machines, scrap metal, plumbing, trucks, uniforms and field gear. Unique to Government Auctions is the ability to go and physically inspect all objects if you are in the area as you use all the government auction information to find ones near you. Tophatter has been gaining steam in recent years thanks to its extremely affordable product range that is provided in house and by a variety of businesses and wholesalers. 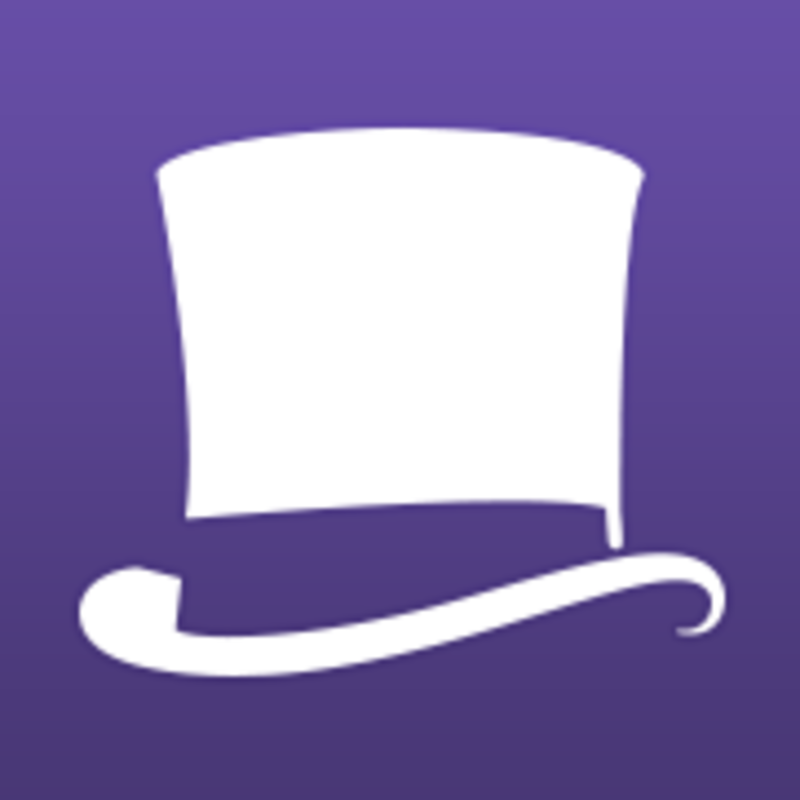 Individuals can also sign up to sell on the Tophatter platform although these are currently the minority. This eBay alternative really shines on prices with strong price competitiveness already on the platform and enhanced further through the quick flash auctions making it easy to grab bargains for the most popular categories. Overall Tophatter offers millions of products, great buyer protection, and plenty of opportunities for free shipping, making it a strong option for online shopping. 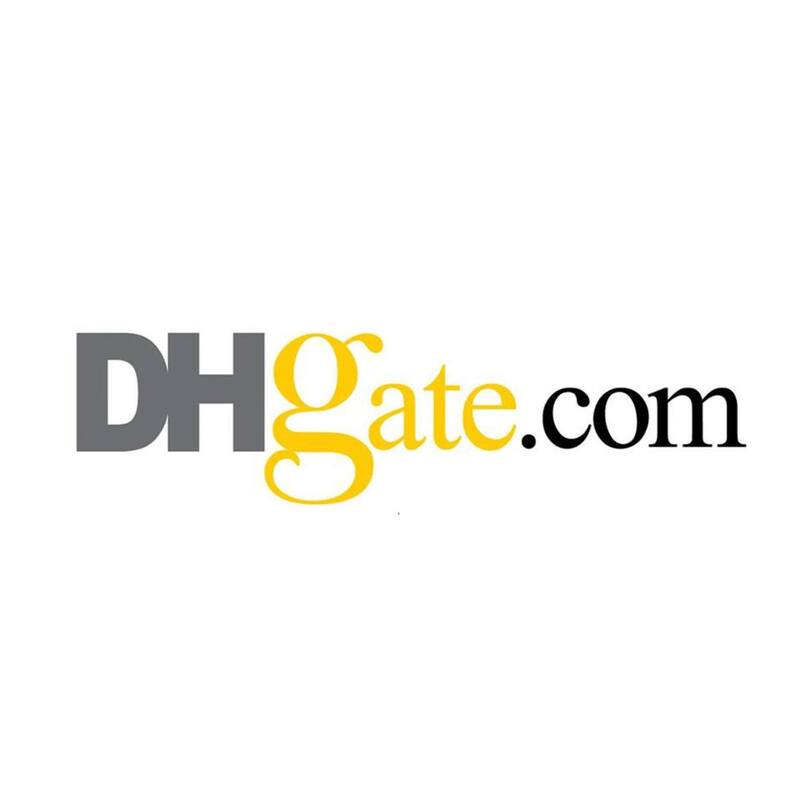 DHGate works in the business to business and consumer space, offering you direct access to countless factories. This ensures you'll get some crazy prices on a range of products from electronics to clothing and everything else. 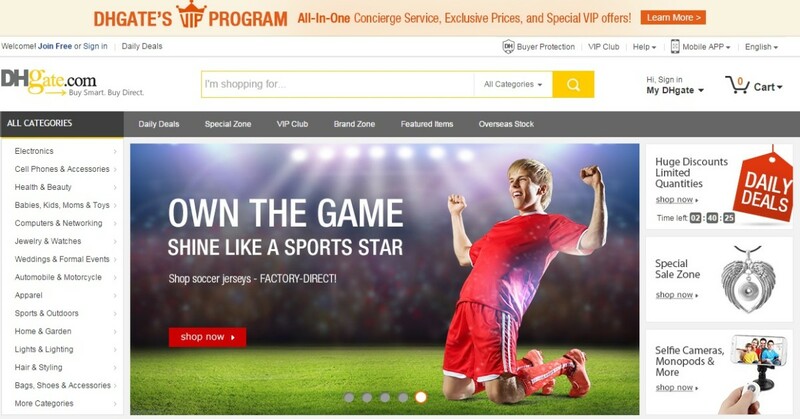 By connecting you directly with factory outlets (often overseas ones), DHGate serves up some of the most competitive prices you'll find in online shopping. It also promises to protect the quality of products you receive by carefully reviewing sellers and witholding your payments until you're happy with your product, which incentivizes the seller to deliver the best quality possible. For cheap prices and many daily deals, you can't look past DHGate. The Quirky Shop is an interesting website that allows users to design their own products and vote on the designs of others so that top ideas eventually get produced for sale on the website (with a revenue split for those who helped make the idea a reality). 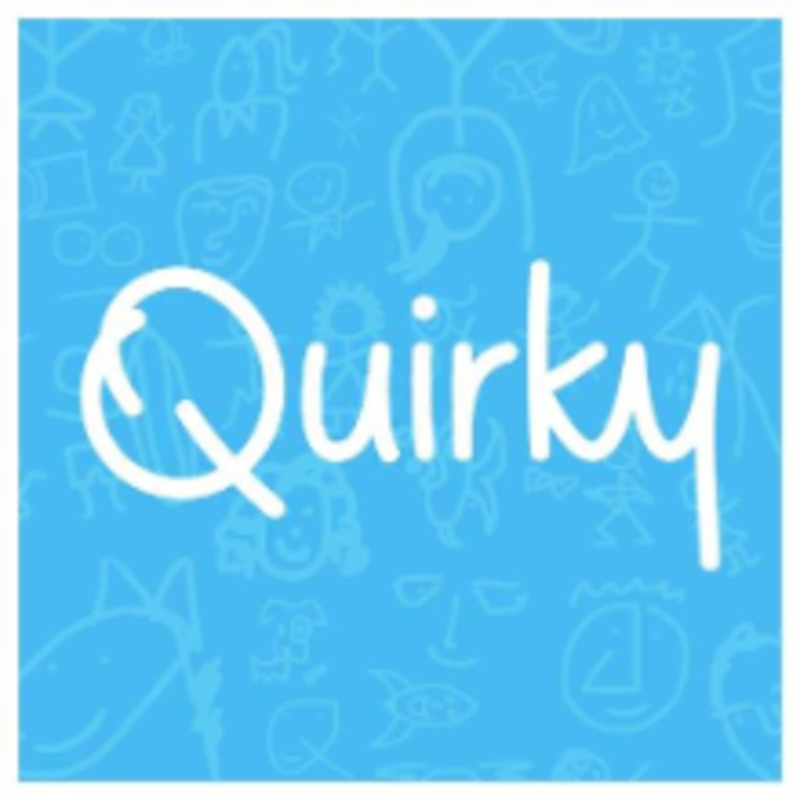 Quirky has a large range of unique products perfect for gifts or use yourself. From a pivoting power surge board to better cable management or a futuristic dustpan, the Quirky range of products has something for everyone. The website is also perfectly suited to people with product ideas that want to get their product out there on the market. Have You Used Any of These Sites? Share Another eBay Alternative! I bought a car cam from dhgate for 8 bucks works great too and I received it way before it was due .. I am definitely going to check some of these out. It's worth knowing where to go. I am a little tired of Ebay, all the fees are making it hard to even make any money. An old roommate of mine used to buy stuff on Beyond The Rack, very cool site as well! Great list!! With ALL the worthless scams sellers on eBay, their supposed highly touted worthless "money back" guarantee, their "waste your day" call centers, AND, their MANY fraudulently sellers, that keep getting away with burning the people who fund them, THANKS for All your info! There HAS to be a Better site out there to NOT get ripped off on! Will try these and others! Wow, you hear that there are many sites like eBay but you never really research it. This kinds of articles are a real eye-opener. Thank you for sharing and great hub! Voted up. Helpful Hub! Thanks for posting. Good writing and easy to navigate. Ebid is a good alternative to ebay. Ok, you have to pay an up-front fee for a 'Lifetime Seller' account, but there are no further fees to pay (unless you use selling upgrades). Ebid appears to have fewer listings than ebay, but that is only because they actually enforce their listing rules about not having multiple listings for the same item. List a designer brand item on ebay at to lower price and they will come down on you like a tonne of bricks. 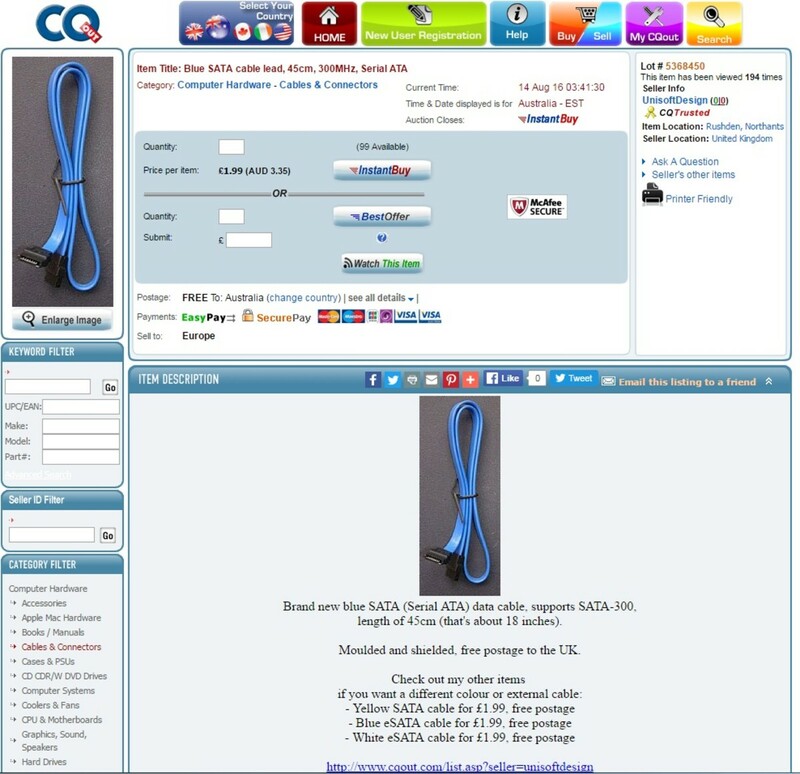 Create 20 identicle listings for an item and they won't even bat an eyelid. Do the same on Ebid and they will ignore the designer brand item, but come down hard on the multiple listings of the same item. Ebay have reached the point that they are so heavily invested in their system, that if they enforced their 'no multiple listings of the same object' listing policy, the drop in the number of listings could well start a mass exodus of sellers and buyers to other sites. Well this was an interesting read. I use ebay myself here and there for online sales and alternatives are always an interesting way to roll to try to see if there's other places you can go to, to try 'em out and see if they work. I used to use this site called Yardsellr, but apparently they ended up going under. It was interesting in the fact that you could actually comment on auctions/listings. Very informative and a lot of options to choose from. Great useful hub. Very interesting, thanks for sharing this info. Good info here, I have already tried 3 of these but good to know about some different ones. I have another place you can try! Thank you all for posting so much helpful info! I have been selling successfully on eBay and Etsy, but ran out of free listings on eBay so I needed some alternatives. I am definitely going to try some of these out! very informative . tks for article. Very good information as well as the additional sites listed in the comments. I'm going to try a few of these out. 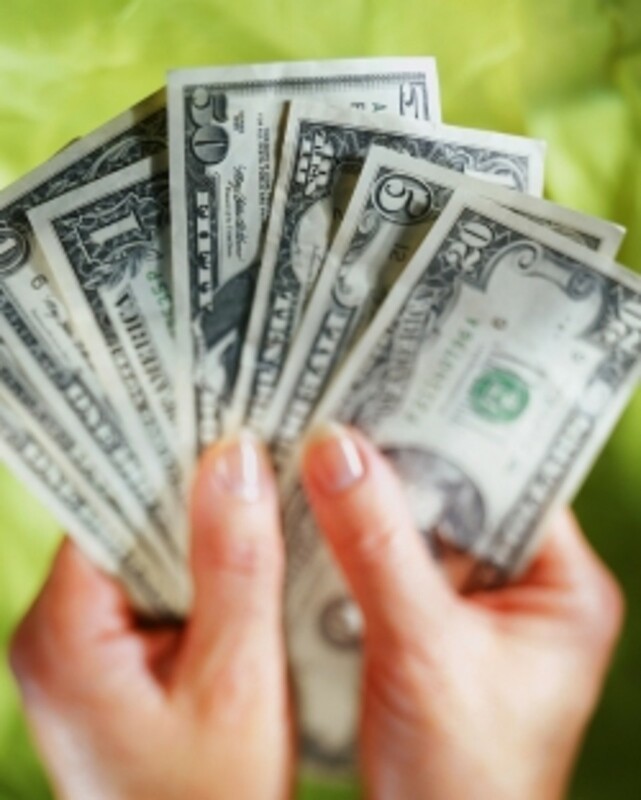 They don't charge listing fees, commission fees, or sign up fees. So you keep 100% of your profits. The site has many features as well like, HTML listings, advanced visitor counters, Google maps and much much more. Not to mention it's simplicity. However, no one knows about it yet because it is still in beta, I guess. As a successful firearms dealer, I have sold several handguns on Auctionbunker. You can sell pretty much anything there. Best of all the site is free and compliments my website products with further product exposure. I love Etsy. Good to see all these alternatives and I wonder if they attract enough buyers and sellers so that one's likely to find something they're shopping for thereâor, if selling, if the venue's likely to attract buyers for what you're selling. I like your work and your lens. These are great websites where you can sell and buy products. A very useful list. Thanks for sharing. 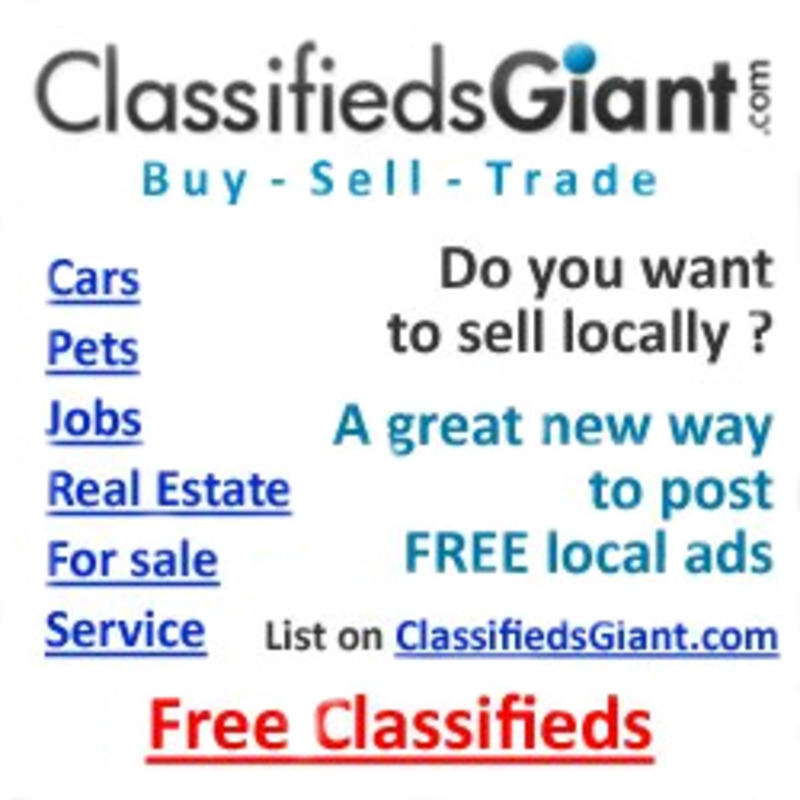 Yes, I sell on Bonanza.com - 100% free to list. Just came back here to enjoy these suggestions and to say that I have included you on my new lens about my own eBay business. Very helpful. I also would suggest craigslist - no listing fees and perfect for some items that work better with local pickup. Great info. I have done well with Amazon. Craigs List just doesn't work for me -- get too many shady characters that way. Awesome lens. Had difficulty with eBay; looking for alternatives. Thanks for sharing. I have used Ebay, Amazon and Craigslist. Craigslist is by far the shadiest of all. So many scams there its unbelievable. That's why I started www.beatcraigslist.com to show people all the scams to watch out for on Craigslist. Great information on this lens - some of these sites I hadn't heard of. Thank you! 3. Auto sync with ebay..carry all your listings from ebay along with the ratings and feedbacks in just a click. 9. A platform that allows you to know the counterparty and build trust on the basis of work profile, school, college and other such dimensions. We have released our beta version and the new website with all these points said above will be launched soon in June, 2013. We request all the sellers to list their product and leave us a feedback to help us improve more and give you a splendid experience of selling online. Overstock is a great place to pick up stuff for your house or apartment. I've stocked a lot of my kitchen that way! Very nice, didn't even knew half of those existed. Nope. I didn't know there are so many alternatives to eBay. Great to know that, thanks! I didn't know about a lot of these. I usually use Amazon. 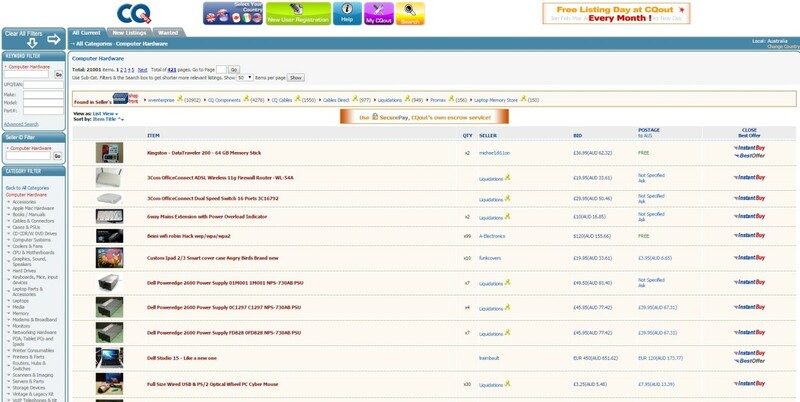 Just eBay, unfortunately most of these sites require you to have a credit card to sell. Great Lens, thanks for sharing. amazon only! I haven't tried the others in your list.